Making the call on where to take your child when they are sick or injured is an important one. 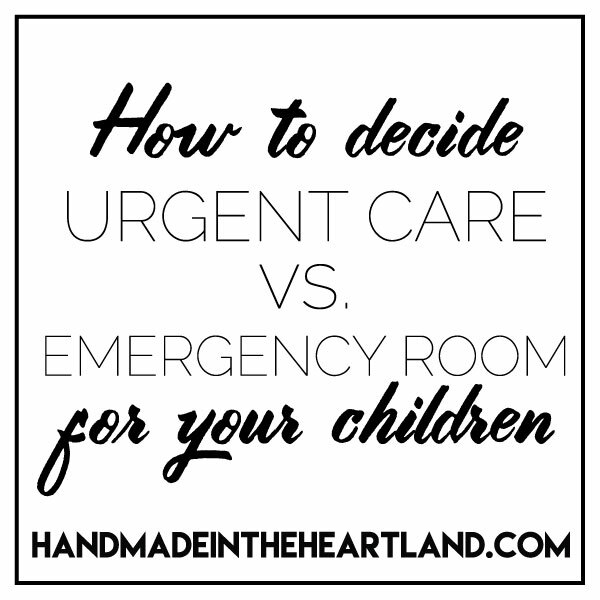 Choosing between going to your pediatrician, urgent care or the emergency room can be difficult, I’ve got some tips to help! This post is sponsored by Children’s Mercy Hospital. 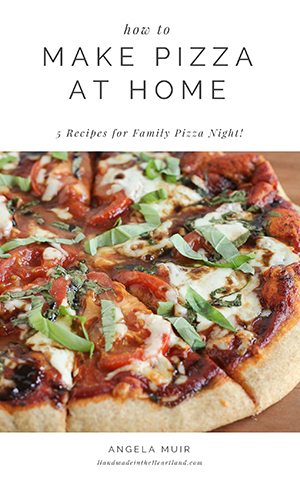 I am a part of the #CMHMoms team of bloggers to bring you important information regarding child health! I have three kids and as it turns out my oldest has been to the hospital more times that anyone else, and within the first two years of his life. Sometimes it can be a hard decision of where to go. As you know the situation determines where you’ll go for care. I find the most difficult decisions come after the pediatrician is closed. Do I wait or go to urgent care? I’m more of a let’s go right to the doctor (that’s how my mom was) and Matt is more of a let’s wait and see. It’s good because we balance each other out. I love that my pediatrician has a 24 hour nurse line to Children’s Mercy and so if I’m really debating whether or not to go at 9pm on Saturday I can call and ask first. Here is a chart that can help. 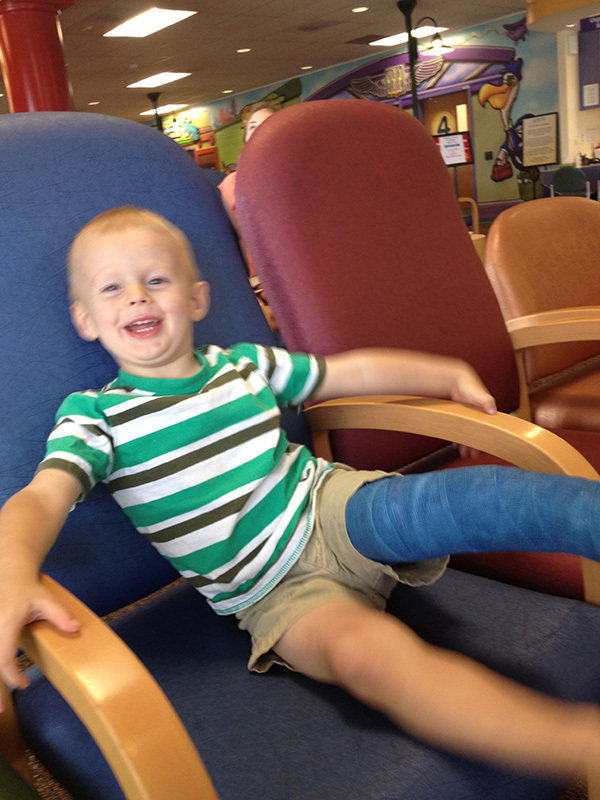 Children’s Mercy has Urgent Care and Emergency Rooms across the city. See which one is closest to you HERE. Did you know that a lot of cases that are seen at the E.R are non emergent and could have been taken care of at an urgent care clinic? Which would probably have saved some money! If you do have to go to an ER with a child and you’re in the Kansas City area, from my experience, other hospitals will just send you to Children’s Mercy so I would just go strait there. Pediatrician: Your primary pediatrician is the best place to start when your child is sick or hurt. They know your child’s health history, including any underlying conditions they may have. However, what if you get sick or injured when your doctor’s office is closed? 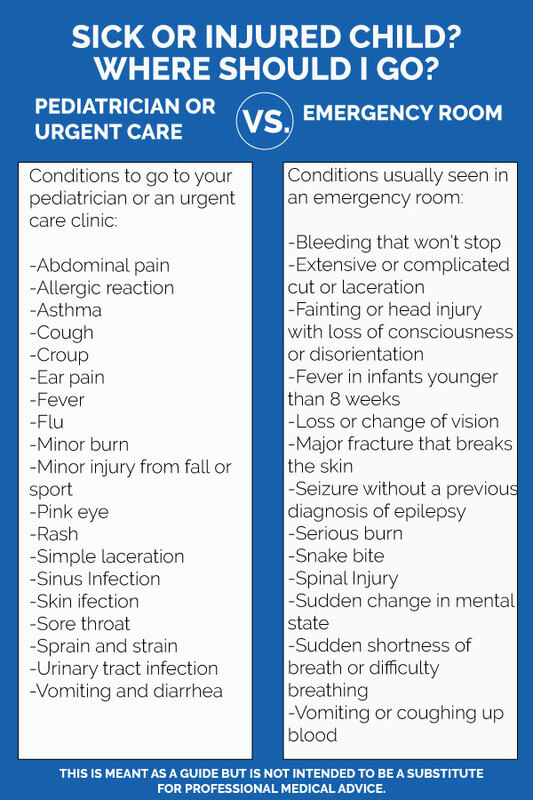 Urgent Care: If your child’s condition isn’t life-threatening but needs to be taken care of right away, then urgent care may be the right choice. And, in most situations, you’ll find that you save time and money by going to urgent care instead of an emergency room.  Emergency Room: emergency departments are the best place for treating children with serious or life-threatening injuries or illnesses. Children’s Mercy offers a Pediatric Level 1 Trauma center, the only one between St. Louis and Denver, which is specially equipped for children and offers immediate access to a wide variety of highly trained and certified doctors, surgeons, nurses and other personnel and kid sized equipment 24 hours a day, seven days a week. We have been to the ER twice for Max. The first was when he was about 10 months old. He woke up early and I laid him on top of me in bed thinking he might fall back asleep for a minute or two but he just kept crying, it was a different cry. I could tell something wasn’t quite right. Matt took him downstairs and took off his PJ’s. As he took off the footie pajamas he noticed a silver metal needle (threaded!) coming out of the heel of his foot! He went to pull it out and it broke! He came up and told me and we assumed there was more of the needle in his foot. We went strait to the Emergency Room at Children’s Mercy downtown. Sure enough the x-ray showed that there was about an inch of a sewing needle in his foot. They had to do a quick surgery to get it out, it had slid up far enough that it couldn’t just be reached with tweezers so they had to do a teeny little slice and then pull it out. That morning was a frenzy of feelings for me. First of all the sewing needle was obviously mine and I had NO idea how it would have ended up in his pj’s and then in his foot! I felt terrible. However, as soon as we got to Children’s Mercy I felt much better being in the hands of great nurses and doctors. 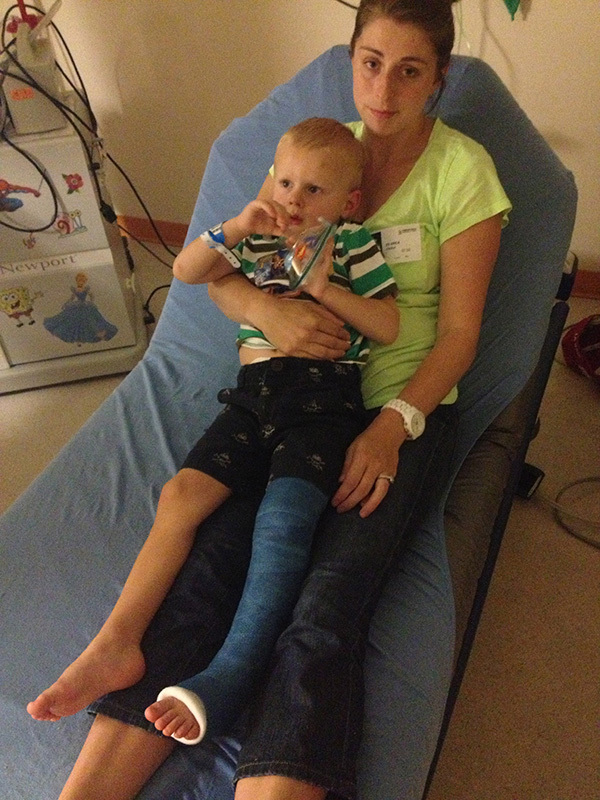 The second time we went to the ER at Children’s Mercy was for an injury. Max was 2 and we had been to a gymnastics gym playing for over an hour during open gym time. Max had been going non stop jumping on trampolines and into the foam pit. All of the sudden I look over at the trampoline where he was jumping and he was laying down crying. He had just fallen the wrong way and his leg was hurt. I picked him up and he immediately asked to go home, uh-oh, This kid never asks to leave. I took him home and put him on the couch and after a few hours he still wouldn’t put any weight on his leg. I called Matt and we decided to head into the ER. 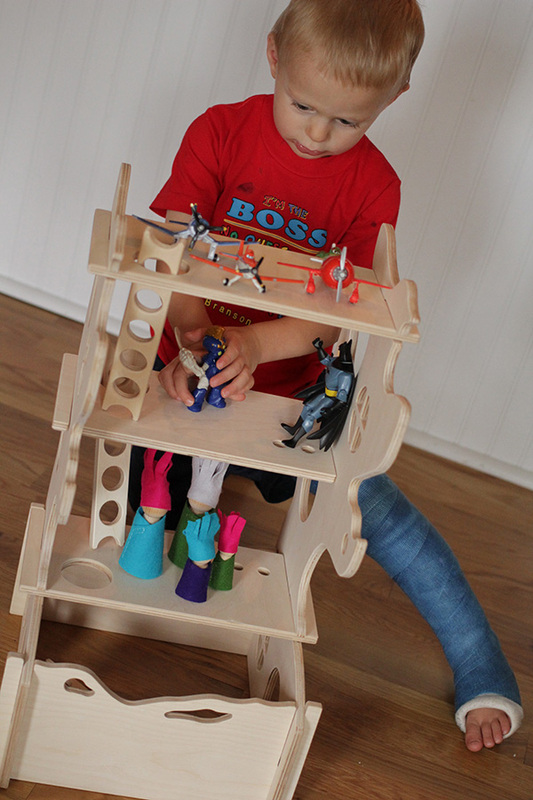 It was the right move because as it turned out his tibia was broken! I was sure they were going to get there, take an x-ray and tell us everything was fine, that he just sprained it, but boy was I wrong! 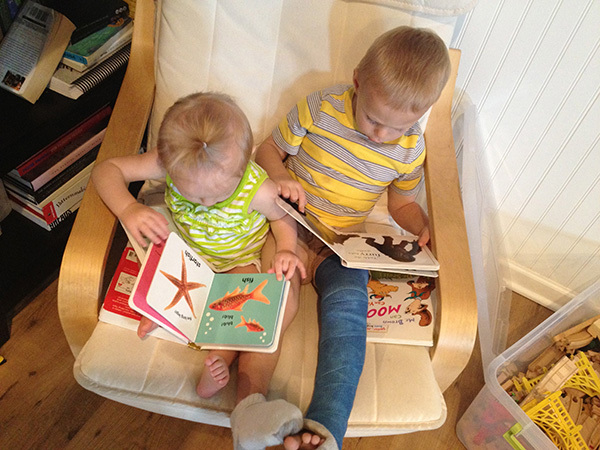 My cute little boy was in a full leg cast for the next 6 weeks of summer. Through both E.R experiences I’m so glad we went to Children’s Mercy to receive care that we couldn’t have found anywhere else. There is such a peace of mind knowing that these doctors work with children every single day, that they specialize in these little bodies and know the ins and outs of how to help them.